At some point during the 1990s, lamb shanks were “it”. Long simmered with a dark, rich sauce and usually served with white beans. The dish was everywhere. Until it wasn’t. Going through lots of cookbooks from the 1800s and 1900s, I don’t really find this dish until around the 1990s. Not that it couldn’t have existed, but it wasn’t really wide spread. The most popular cuts of lamb are “leg” and “chop”. I am rather partial to the “shoulder” as well, but that’s fairly hard to come by in the regular grocery store. Chops are crazy expensive, so I usually don’t buy them and truly hate when they are listed on a menu as “lollipop”. Ugh. Just no. The leg is very nice and I cook with this often. Today, however, I focus on the “shank”. The shank is part of the animal’s lower leg. As a result, it does a lot of work making the meat very, very tough. There are a variety of ways to tackle toughness. Long, low braising and pressure cooking. This recipe is adaptable to both. What I love about this recipe is that there is very little active time. Most of the time you are hanging out waiting for either heat or pressure to do its thing. Homework, bill paying and all the rest can be done, which is great for this working mom. Lamb shanks can be on the table in less than an hour with the pressure cooker, or if I get home early, I can start dinner then set about doing my other mom duties. 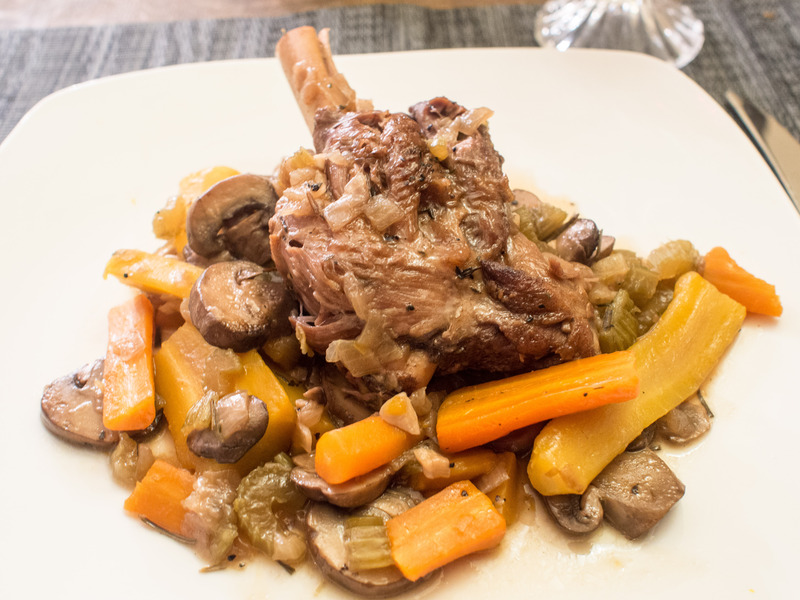 As a bonus, lamb shanks also give the impression that someone with extreme culinary skills made the dish, when truly, they are not required. You can’t really overcook this meat and it’s a very low maintenance recipe. 4- 5 medium carrots, peeled, large dice. In a dutch oven, heat oil over medium high heat. 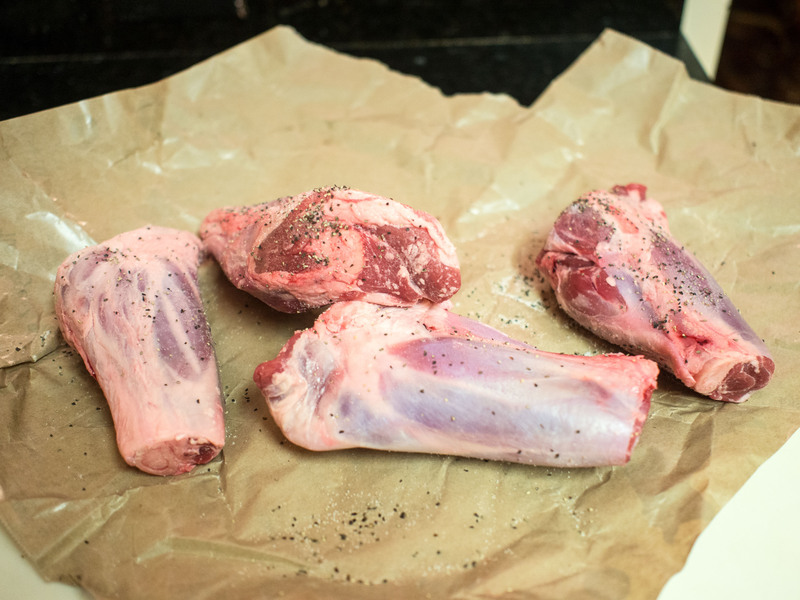 Sprinkle the lamb shanks liberally with salt and pepper. Place heated oil and brown, about 2 minutes a side. Remove to a plate and set aside. Add onions and celery to the dutch oven. Cook until onions are translucent and celery is soft. Scrape up any brown bits left over from the meat browning when the onions start to let off some liquid. Add mushrooms, thyme, rosemary and carrots. Cook until the mushrooms have given up some of their liquid. Add the chicken broth and wine and simmer until the alcohol is cooked out. Return the lamb shanks to the pot. Cover the pot and place in the oven to cook for 90-120 minutes, until tender. Please follow your pressure cooker instructions for using your pressure cooker. As above, heat the cooking fat in the pressure cooker, salt and pepper the shanks and brown them for about 2 minutes on each side. Add onions and celery to the dutch oven. Cook until onions are translucent and celery is soft. Add mushrooms, thyme and rosemary. Cook until the mushrooms have given up some of their liquid. Add the chicken broth and wine and simmer until the alcohol is cooked out. Return the lamb shanks to the pot. Make sure the shanks are at the appropriate height level for your pressure cooker. Add the lid to your pressure cooker and cook the shanks on high pressure for 25 minutes. Remove the pressure cooker from the heat and allow to cool down. When safe, remove the lid, add the carrots and return to the heat for another 10 minutes. Remove from heat and allow the pressure to cool down again. When safe, remove the lid and serve. This entry was posted in Gluten Free, Lamb, Low(er) Carb, Main Dishes and tagged easy weeknight dinner, Gluten Free, Lamb, Low Carb, shanks, special occasion dinner on February 15, 2014 by dawn of food. Yum! This looks delicious – would love to have this for dinner. Gluten Free Fabulous, thanks for stopping by! It was a really awesome dish, and one of our favorites in the rotation!